President Larry Roberts called the meeting to order at 6:37 p.m. Directors present for the meeting were Nicole Andress, Christy Astorga, Bonnie Brooks, Errol Daniels, Susan Haag, Todd O’Donnell, Ty Payne, Larry Roberts, Larry Sassa, Paul Smith, Lamar Strother, Douglas Tillett, and Jim Van Cleave. Doug Alred, Jane Alred, Angela Harris, Dennis Harrison, Stan Lambert, Franz Lerch, and Stuart Toomey were absent. Approval of 11/6/18 (November meeting) minutes: On a motion by Todd O’Donnell and seconded by Ty Payne, the November board meeting minutes were approved as submitted. Treasurer’s Report: Bonnie Brooks distributed copies of the Balance Sheet and the Profit and Loss Detail Statement through December 3, 2018. Line items discussed included income from Guana, The Last Gasp, and GRR training class. Expenses included donations to Sulzbacher Center for the dinner service and JALA for the Freed To Run 2.0 event. Other expenses included payments for the newsletter, race team entries for Pumpkin and Mandarin races, Guana race expenses for the post-race party, and the half marathon training class expenses for shirts and Coach DeSantis. Emerald Trail Plan Update – Larry Roberts reported that city council had approved a plan in September. Colin would provide more information at our January meeting. East Coast Greenway could be connecting into the Emerald Trail. Larry will be walking a 5-mile trail segment with Mark Woods of The Florida Times-Union for an upcoming story regarding the conditions and the potential of Jacksonville’s trails and walkways. 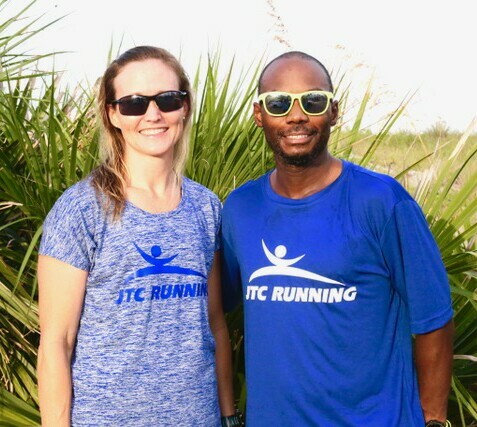 Where to Run in Jacksonville on JTCRunning.com – Paul reported that the Florida Striders have a similar set up on their website where you can view maps, distances, and locations. He mentioned that Stephanie Griffith sends out emails with details of routes and locations. Another useful tool that 1st Place Sports has used for similar results is the Map O Meter website. Sulzbacher Run, Jump, Throw – Larry stated that Angela Harris would report more details as she continues to work closely with the event planning. Freed-to-Run – Is scheduled for Friday December 7 at 3:30pm. Members that are volunteering should plan to arrive between 2:30pm-3pm and should refer to Dennis Harrison’s email regarding shirts, duties, and procedures. USATF Convention Report – Doug Tillett reported on the most recent USATF convention. Doug spoke in detail regarding new rules in terms of changes and updates (eligibility, dual citizenship). He spoke regarding the club being a member of USATF, however that does not mean that each JTCR member is automatically a member of USATF. He gave an overview of benefits of membership, as well as the different categories of events (track, long distance, race walking, etc). He mentioned as part of the convention he attended a Safe Sport meeting, which is a course that ensures the safety of kids. He also mentioned that the USATF plans to revamp their website as they feel that it is too congested and not easily navigated. Runner Exchange with Nantes, France – Doug Tillett reported that we have been contacted regarding an opportunity to participate in an runner-exchange opportunity with Nantes, France, which is the sister city of Jacksonville. The idea is to host runners from Nantes, France, for the October Jacksonville Half Marathon in exchange for them hosting JTCR members to run an event there. More information can be found in the newest newsletter; however, we should try to gather and gauge interest once the newsletter is available. Gate River Run Training Class Kickoff – Larry reported that the kickoff class will be Wednesday, January 2nd at 1st Place Sports, San Marco. Currently 45 returnees are signed up. Guana Trail Races (Sun 12/2/18) – We had 226 runners including day of race registrants. Members in attendance mentioned that they had heard that some participants experienced issues with race timing and relay distance accuracy. Larry stated that we need to follow up regarding these issues. Last Gasp (Sat 12/29/18) – Currently there are 62 runners signed up, which it is expected to double or triple as we get closer to race day. Winter Beach Run (Sat 1/19/19 @ 2pm) – Larry reported that he had spoken with Doug Alred regarding race details and he was informed that there would not be beer at the race, and a more detailed report would follow at the next meeting. It was brought up whether the Marathon High runners will receive complimentary entries or receive discounted entries for the race. Also, the date is the same day as our 1st track meet. Gate River Run (Sat 3/9/19) – Currently 2,300 signed up. Gate River Run Publicity/Sponsorship Committee – No Report. Race Committee / Track Meet Committee – Track meet 1/19/19, same day as Winter Beach Run. Classes & Clinics – Holiday social is Saturday, December 8th at 6pm (after Festival of Lights) at the 1st Place Sports-San Marco Store. Community & Public Relations (Gate River Run Video) – Larry Sassa reported that he recently met with Alan Frazier of Creative Studios to discuss the Gate River Run video and marketing efforts. He also mentioned that he spoke with Cole Pepper of Channel 4 News, to look for archived video of GRR. He also mentioned that we should consider using marketing and PR companies that are geared toward markets and niches. We should also utilize our club members who may specialize in areas of advertising, design, and so forth. Finance – Bonnie stated that the club’s Form 990 is currently in final review and should be completed in a few weeks. Membership – Membership was currently at 1,184 active members. Merchandise LogoXpress – We will have merchandise on hand at the holiday social. We will have a table set up with the new merchandise we have so that members and guests will be able to see and feel the products. Again, we will need to develop a strategy for the existing merchandise as we gear up for the upcoming race and expo season. Communications: Newsletter, Social Media – Our last issue of the year has been sent out in the mail as well as the e-blast. The issue will contain information regarding merchandise and gifts for the holidays, The Last Gasp, and the runner exchange opportunity. NEXT MEETING – The next board meeting will be Monday, January 7, at 6:30 pm in the Mediterrania Restaurant. The December meeting was adjourned at 7:58 pm.